To respond to the serious and underrecognized epidemic of kidney disease in the United States, the US Food and Drug Administration and the American Society of Nephrology have founded the Kidney Health Initiative—a public–private partnership designed to create a collaborative environment in which the US Food and Drug Administration and the greater kidney community can interact to optimize the evaluation of drugs, devices, biologics, and food products. The Kidney Health Initiative will bring together all the necessary stakeholders, including patients, regulators, industry, health care providers, academics, and other governmental agencies, to improve patient safety and foster innovation. This initiative is intended to enable the kidney community as a whole to provide the right drug, device, or biologic for administration to the right patient at the right time by fostering partnerships that will facilitate development and delivery of those products and addressing challenges that currently impede these goals. Kidney disease in the United States is a serious and underrecognized public health epidemic. The overall prevalence of CKD, defined as an estimated GFR<60 ml/min per 1.73 m2, is currently estimated at 6.7%. The increased prevalence of CKD has been attributed, at least in part, to rising rates of obesity, diabetes, and hypertension—all factors contributing to kidney damage (1). The population with treated kidney failure reached a new high in 2010, with 415,013 patients in the United States receiving long-term dialysis treatment (a 46% increase since 2000) and another 179,361 patients living with a functioning kidney transplant (2–4). Although the promise of scientific advances in biotechnology, genomics, and material science has translated into tangible breakthroughs in oncology and cardiovascular disease, research and development in the area of kidney disease have been relatively stagnant. Symptomatic of this scant research and development activity, the field of nephrology has generated the fewest randomized controlled trials (RCTs) of any internal medicine subspecialty, and some data suggest quality concerns with the RCTs that are conducted (5–7) (Figure 1). 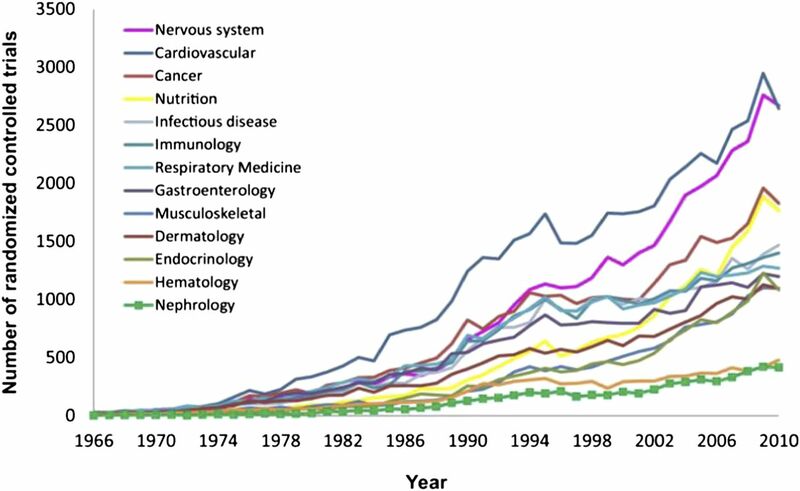 Number of randomized controlled trials published in nephrology and 12 other specialties of internal medicine from 1966 to 2010. Reprinted from reference 6, with permission. According to CenterWatch, an independent organization that maintains databases of drugs approvals, the US Food and Drug Administration (FDA) awarded products (including new and previously marketed products) with 37 indications that CenterWatch classified as related to nephrology between 2002 and 2012 (8). However, fewer than one half of those approvals related to indications that most nephrologists would recognize as treatments for the kidney; rather, indications related to bladder conditions, erectile dysfunction, and cancer comprise the majority (Table 1). In comparison, CenterWatch reported that the FDA awarded products with a total of 85 indications that CenterWatch considered related to oncology during the same time period (8). This disparity highlights the therapeutic gap for drugs that treat the kidney. New interventions capable of meaningfully responding to the root causes of the epidemic of kidney disease in America have not been delivered. In addition, there is increasing awareness that medical products intended for a variety of nonkidney indications may have adverse off-target impacts on kidney health. A comprehensive response to kidney health-related concerns should also afford kidney experts opportunities to share their perspectives during the evaluation of those products. Recognizing these concerns, in 2012, the FDA established a public–private partnership with the American Society of Nephrology (ASN), the largest organization of clinicians and researchers on kidney function and disease. The mission of the Kidney Health Initiative (KHI) is to advance scientific understanding of the kidney health and patient safety implications of new and existing medical products and foster development of therapies for diseases and conditions that affect the kidney by creating a collaborative environment, in which the FDA and the greater kidney community can interact to optimize evaluation of drugs, devices, biologics, and food products. KHI will bring together all necessary stakeholders, including patients, regulators, industry, health care providers, academics, and other governmental agencies (Figure 2). KHI will serve as a forum to facilitate dialogue and research that informs regulatory science with regard to kidney health and patient safety. This initiative will enable the kidney community as a whole to provide the right drug, device, or biologic for administration to the right patient at the right time by fostering partnerships that will facilitate the development and delivery of those products and addressing challenges that currently impede these goals. Stakeholders participating in the Kidney Health Initiative. The reasons for the dearth of research and development in nephrology are multifactorial, and include a lack of infrastructure and collaboration as well as the fact that the pathophysiology and natural history of many kidney diseases do not lend themselves to readily defining appropriate trial designs, valid end points, and regulatory pathways. Many types of kidney disease that would be good candidates for clinical study would likely require coordinated multicenter trials to appropriately assess the efficacy and safety of any experimental or already marketed drugs. However, unlike the cardiology, neurology, or oncology fields, nephrologists have yet to develop patient and provider networks that could facilitate the conduct of the large clinical trials necessary, especially for patients whose kidney disease does not (yet) require long-term dialysis. Several of these conditions (such as lupus nephritis, ANCA vasculitis, and other glomerulopathies) are relatively rare—an added challenge. Similarly, there has been little effort to coordinate and collect standardized data through registries and trials. In the field of nephrology, far too few RCTs have examined the conditions responsible for a majority of the morbidity and mortality associated with kidney disease (such as cardiovascular or infectious morbidity in CKD). Instead, major research efforts have focused on issues that are scientifically rich in the context of mechanisms and pathways but do not have a direct effect on patient outcomes. Although cardiology and oncology fellowship programs routinely offer their fellows opportunities to participate in clinical trials, there are relatively few such opportunities for nephrology fellows given the limited number of nephrology-related trials. Moreover, the few nephrology trials that are conducted are often underpowered and incapable of supporting conclusions that would meaningfully improve clinical practice. Similarly, academic opportunities for nephrologists typically focus on bench research and/or epidemiology research (perhaps a marker of the training that their mentors received). The previous generation is likely to train the next generations as they have been trained, and therefore, the situation becomes self-perpetuating. Although it is worth noting that the National Institute of Diabetes and Digestive and Kidney Diseases does not receive as much federal funding as, for instance, its counterpart institutes focused on cancer or heart diseases, the lack of emphasis on clinical trials and innovation in nephrology cannot be attributed solely to this fact. One major factor stymying clinical trials in nephrology is the absence of end points that are widely accepted by academia, industry, and the FDA. As opposed to cardiology and oncology—fields that have a plethora of established trial designs to assess heart attack, stroke, and heart failure or tumor size—nephrology is handicapped by the lack of similarly well developed approaches to study kidney disease. The greatest advances in a particular field of medicine are almost always made through a multidisciplinary approach, bringing health professionals, industry, and patient advocacy groups to the table (ideally in concert with input from regulatory agencies). Although other specialties have embraced such multidisciplinary partnerships, such as the Cardiac Safety Research Consortium (CSRC), there currently is a pointed lack of such initiatives within the kidney community. During the past 50 years, biology and medicine have experienced exponential growth. To keep pace with rapid scientific and technological advances, the FDA has expanded commensurately. As of October 1, 2009, the FDA had 11,516 employees (9). This number compares with 4363 employees in 1970, fewer than 2000 employees in 1960, and 955 employees in 1950 (10). The depth and breadth of expertise brought by FDA staff are necessary to enable expert evaluation of the range of increasingly complex medical products that the FDA regulates. These employees currently staff six centers (biologics, drugs, devices and radiologic health, food safety and applied nutrition, tobacco products, and veterinary medicine) as well as the National Center for Toxicological Research. In addition to these centers, the FDA also has numerous other offices dedicated to issues including but not limited to regulatory affairs, scientific inspections, special programs, and policy and planning. All of these centers and offices ultimately report to the Office of the Commissioner. Figure 3 presents a partial organizational structure of the FDA, focusing on the relationship of various centers with the Office of the Commissioner and one another. A partial organizational chart of the US Food and Drug Administration highlighting the relationship of the various centers with the Office of the Commissioner and one another. Within each of the centers, the review and monitoring activities of products are further allocated to offices, divisions, and branches according to therapeutic area (such as rheumatology) or discipline (such as epidemiology). For instance, the signatory authority related to the review of new drug applications and biologic license applications within the Center for Drug Evaluation and Research (CDER) rests in its Office of New Drugs. 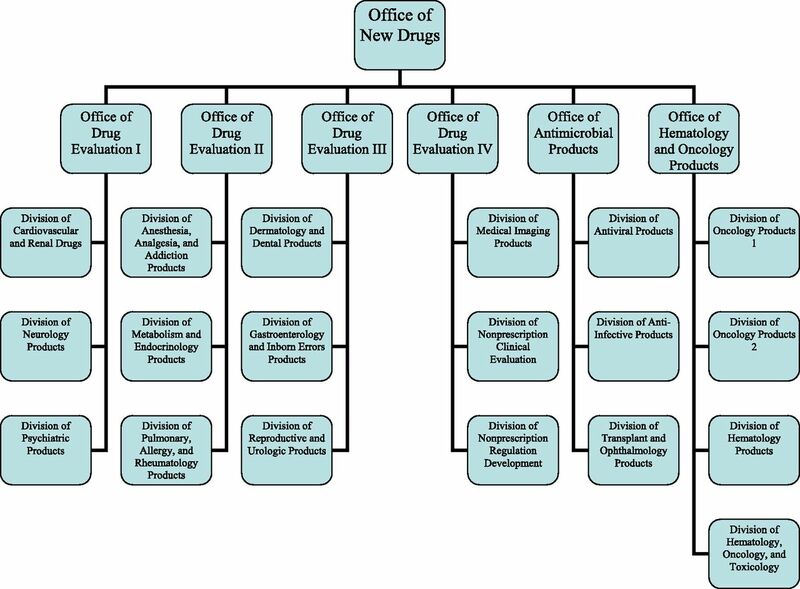 A total of 19 divisions, organized into various offices, comprises the Office of New Drugs and performs the reviews of applications for those new drug and biologic approvals assigned to the CDER (Figure 4). The divisions are staffed to provide expert review of subjects ranging from dermatology to oncology to psychiatry. Generally, the organizational structure of the FDA works well to ensure that the appropriate expertise is available to address the issues of any given product. Organizational chart of the Office of New Drugs of the Center for Drug Evaluation and Research. The range of products that impact kidney health is, however, unusually large. In part, this fact reflects the breadth of diseases that affect the kidney, such as lupus nephritis, diabetes, hypertension, and hepatitis C. In addition, it is attributable to the role of the kidney in the elimination of exogenous drugs, toxins, and their respective metabolites, which may appear in particularly high concentrations in certain areas of the kidney (with kidney dysfunction impacting the biologic activity and toxicities of these agents). It is also because of direct toxicity to the kidneys of available drugs as well as drugs, devices, and biologics within the development pipeline. Finally, it is attributable to the large number of products that target other organ systems but are particularly pertinent to patients with kidney disease, such as products intended to treat anemia or manage bone health. As a consequence, a large number of review divisions across the FDA share the responsibility for regulating products that impact kidney health. For instance, although lupus nephritis, diabetes, hypertension, and hepatitis C all affect the kidney, therapeutics designed to treat these indications are all regulated by different divisions within the CDER and depending on the nature of the therapeutic intervention, potentially by centers other than the CDER. Given the number of products that affect the kidney, scientists throughout each of the various centers develop experience in evaluating the impact on kidney health of the products that they regulate. In addition, the different centers, divisions, and branches can and do consult one another as needed. However, not every review of every product will receive input from a kidney specialist. As a result, the same organizational principles that allow the FDA to ensure that each product is reviewed within a division or branch with specialized expertise pertinent to the primary indication of the product also lead to a certain degree of heterogeneity in review practices across the FDA. Challenges exist in ensuring that the kidney health perspective is given consistent consideration. Finding mechanisms to address these challenges would help ensure that marketed products have received an appropriate safety evaluation and facilitate the development of new products. By facilitating ongoing, iterative dialogue and interaction between the FDA and kidney community stakeholders, KHI is poised to help identify specific instances of these challenges with respect to kidney health and provide a forum to develop solutions. Section V of this manuscript elaborates on KHI's process for executing its mission. The establishment of KHI creates a collaborative environment in which the entire kidney community (including patient advocacy groups, industry, government agencies, and professional organizations) can overcome existing challenges, including regulatory and nonregulatory barriers, and optimize the development and safety of products that impact kidney health. Although KHI is dedicated specifically to the area of kidney health, the FDA has developed significant experience forging collaborations with external stakeholders over the past several years through its Critical Path Initiative. The Critical Path Initiative is the FDA's national strategy to drive innovation in the scientific processes through which medical products are developed, evaluated, and manufactured (11). The Critical Path Initiative strives to narrow the gap between the number of discoveries occurring in biomedical science and technology—many of which are the result of National Institutes of Health-supported investigation—and the declining number of new medical treatments submitted for FDA approval. These previous collaborations serve as a model that the KHI will emulate. The Critical Path Initiative was launched in 2004 in conjunction with the publication of the FDA’s landmark report “Innovation/Stagnation: Challenge and Opportunity on the Critical Path to New Medical Products” (12). The recommendations of the report included a call for greater public–private partnership to help improve developmental and translational science. The first such collaboration was the Critical Path Institute (C-Path; http://c-path.org/index.cfm). Through a Memorandum of Understanding, the FDA agreed to participate in a consortium organized by C-Path, where stakeholders could work together with the FDA to improve the process of medical product development (13). Currently, C-Path is the home to several consortia, including the Coalition against Major Disease, the Polycystic Kidney Disease Outcomes Consortium, and the Predictive Safety Testing Consortium among others. Several of these consortia are already doing important work related to some facets of kidney health. Opportunities exist, then, for synergistic interactions between the KHI and C-Path. The FDA has since replicated the C-Path model, establishing other public–private partnerships through Memorandums of Understandings. Two examples include partnerships that the FDA founded with Duke University: the Clinical Trials Transformation Initiative (CTTI) and the CSRC (14,15). The CTTI was founded in 2008 with the mission of identifying practices that, through broad adoption, will increase the quality and efficiency of clinical trials. The CTTI projects have included topics such as improving and expediting safety reports, making trial monitoring more effective and efficient, incorporating quality by design into clinical trials, incorporating the use of central institutional review boards in multicenter clinical trials, and accelerating the development of new antibacterial drugs. The FDA launched the CSRC in 2006 to support research into the evaluation of the cardiac safety of medical products. The example set by the CSRC is particularly pertinent, because it represents a successful model of an effort to create a collaborative environment to advance scientific understanding within a particular medical subspecialty. Some concrete examples of achievements that came out of these public–private partnerships include the qualification by the Predictive Safety Testing Consortium of a set of nonclinical kidney biomarkers and the creation by the CSRC of a large, centralized repository of more than 4 million digitized electrocardiograms for the development of improved electrocardiogram algorithms for the evaluation of electrophysiological safety. In March of 2012, ASN expressed concerns to the FDA about stagnancy in product development related to kidney health and the safety of other products with the potential to impact kidney health. Representatives from the FDA and ASN met to discuss their shared interest in optimizing efforts to address public health issues related to kidney health. Although several options were discussed, the public–private partnership model was deemed especially attractive given the successes of previous such efforts. Both parties noted that the partnership model provides continuity and sustainability—critical elements of an effort intended to transform a sector of medicine as opposed to simply fix an isolated issue. The FDA and ASN continued the dialogue after this initial meeting, developing a mission and objectives for its nascent partnership. These statements were incorporated into a new Memorandum of Understanding, signed by FDA Commissioner Margaret A. Hamburg and ASN President Ronald J. Falk, MD, FASN,. in September 2012. Whereas C-Path has focused on facilitating innovation and CSRC has concentrated on improving safety, KHI scoped its mission “to advance scientific understanding of the kidney health and patient safety implications of new and existing products and to foster development of therapies for diseases that affect the kidney by creating a collaborative environment in which FDA and the greater nephrology community can interact to optimize evaluation of drugs, devices, biologics, and food products.” The specific objectives of KHI are summarized in Table 2. Recognizing that the scope of projects that KHI members may wish to address over time is likely to be wide-ranging, the objectives were crafted with the goal of enabling KHI to take on as broad and diverse a range of issues as possible. Ultimately, KHI functions as a forum to facilitate dialogue and research that informs regulatory science with regard to kidney health and patient safety. This collaborative partnership will help enable the FDA to be more responsive to public health needs identified by patients, health professionals, scientists, and industry. Therefore, the process of the KHI encourages member stakeholders, including patients, practitioners, scientists, industry, and other government agencies, to articulate concerns and propose projects to help address them. The composition of the KHI Board of Directors reflects the diversity of stakeholders in the kidney community and includes representation from other federal agencies, including the Agency for Healthcare Research and Quality, the Centers for Medicare and Medicaid Services, and the National Institutes of Health (Table 3). KHI is cochaired by an ASN representative and an FDA physician. To accomplish its mission, KHI encourages all member organizations to submit project concepts that they believe could improve safety or foster innovation. KHI maintains an open online mechanism for the submission of potential projects by its members, which is depicted in Figure 5. Project ideas are evaluated by the KHI cochairs and Board of Directors to ensure all the selected projects are strongly aligned with the overall mission of the KHI, efficiently leverage KHI resources, and have a well defined strategy for execution. Project submission and execution process. After project concepts are finalized and endorsed by the Board, KHI will post a work group opportunity so that all of its members may apply to participate. The final composition of the work group will be determined by the Board after review of the applications; the Board will make its work group selections after assessing the applicant’s professional qualifications, willingness to dedicate protected time to the project, and manageability of any potential conflicts of interest. It is anticipated that projects will take a wide variety of forms, including (but not limited to) exploring appropriate trial design for various indications related to nephrology, forming patient registries to facilitate the conduct of trials, improving postmarketing surveillance practices, and promulgating new data standards. It is anticipated that KHI projects will span the spectrum of kidney disease from AKI and CKD (including disease occurring after renal transplantation) to dialysis and transplantation/transplantation immunology. Many projects may culminate in publication of a white paper coauthored by KHI members intended to inform and/or extend the FDA’s scientific understanding of a particular topic. KHI maintains a transparent process for objective evaluation of potential projects submitted, including a robust conflict of interest (COI) disclosure and management policy. Individuals with conflicts may not be decision-makers on matters related to the subject of the conflict. For example, an individual with a conflict of interest may not be selected as the project leader of a KHI activity related to the subject of the conflict. Furthermore, an individual with a COI may not participate as a voting member in any committee or workgroup involving the subject of the conflict (16). Maintaining scrupulous management of potential COI, the KHI will provide an inclusive forum to encourage innovations and collaborations that make a real difference in kidney health. To support the activities of the KHI, member organizations pay an annual fee based on the size of their organization, which is depicted in Table 4. These fees will primarily support the operational cost of the KHI. It is also anticipated that the KHI could, in future years, consider seeking competitive grant funding to support specific projects from private or public entities. As public health implications and economic burdens of kidney disease in the United States continue to grow, kidney health warrants increased attention. It is the responsibility of all stakeholders in the kidney community, including patients, academia, health professionals, industry, and other governmental organizations, to work together with the FDA to foster innovation while ensuring patient safety at every step of the product development process. In summary, we believe that the time is right for a proactive approach that will facilitate the availability and administration of the right drug, device, or biologic to the right patient at the right time. Ultimately, these efforts will make an impact on the kidney health of millions, catalyzing a transformation in our ability to prevent and treat kidney disease. P.A. has no conflicts to report. R.N.S. is an employee of the American Society of Nephrology. W.C.W. reports having served as a scientific advisor to Affymax, Amgen, Bayer, Fibrogen, and GlaxoSmithKline. R.J.F. is an employee of the University of North Carolina Chapel Hill School of Medicine. P.R.-C. is an advisory board member and research grant recipient for WL Gore, a consultant for Medtronic, a consultant (current) and research grant recipient (in the last year but not currently) for Proteon Therapeutics, a consultant and research grant recipient (in the last year but not currently) for Shire, a consultant for Bioconnect Systems, and an alternate scientific board member for Schulman Associates Institutional Review Board. The authors would like to thank Tod Ibrahim, Katlyn Leight, and Melissa West for their contributions to this manuscript.